At Caspersen Door Systems in Pocasset, we are committed to providing our customers with outstanding services, and the best products on the market. This is why we carry GARAGA garage doors, and put a lot of emphasis on training our technicians. Our team has been in the industry for many years, and knows everything there is to know regarding garage door repairs, sale and installation. You can trust us with all your garage door inquiries, we will be sure to fix your problems rapidly and accurately! Seems very heavy to open? Schedule your garage door repairs online! Are a member of the IDA - International Door Association. Serve: Falmouth, Bourne, Cape Cod, Barnstable Mashpee, East Sandwich, Sandwich, Martha's Vineyard, Buzzard's Bay, Hyannis, Centerville, Osterville, Cotuit, Marstons Mills, Orleans, Brewster, Dennis, Yarmouth, Chatham, Harwich. Can be quickly reached online to schedule an appointment or call us now at: 508-563-5633. Fix any brand of garage door or garage door opener, and replace parts and accessories. Due to normal wear and tear caused by the pressure and weight of the sectional garage door, springs (counterweight system) will eventually lose force or break. Because they play such a large role in moving your garage door up and down, they are often an issue and need to be maintained or repaired frequently. Saggy springs can quickly become both a safety and a functional hazard. Your springs are also responsible for the longevity of your garage door system; if they are taken care of properly, they will yield an optimal number of cycles before they need to be replaced. Whether your garage door is equipped with torsion or extension springs, both systems must be maintained and lubricated on a regular basis in order to be consistently reliable. Misalignment in the cables or the cables coming off from the pulleys is a common problem with older garage doors. While this may seem like a small issue, it should not be taken lightly. Such a problem will keep your garage door from functioning properly, and will jeopardize the safety of your garage door system. Cables and springs are not repairs that you should attempt to do yourself; in order to realign the springs or cables, you must loosen the torsion bar, which is a dangerous operation especially if you are not familiar with garage door mechanisms. 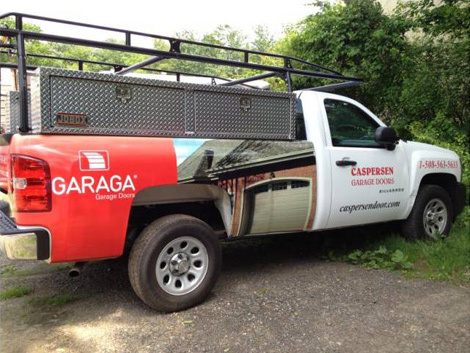 It is much safer to call us at Caspersen Door Systems to handle all your garage door issues in the Pocasset area. By doing so, you will be certain that your door will be in perfect working condition after we leave, that all the safety features will have been tested, and you will ultimately get peace of mind! We are available to answer all your questions, and do not hesitate to contact us for all your residential garage door repair, install and maintenant needs!